The venue for this event was Co-Loft which is a co-work space similar to Gangplank or Co+hoots here in Phoenix. Avesta (@avestar), Cameron (@CameronKashani) & Chris (@chrisdumler) have done a great job creating a fertile environment for supporting startups. I would not at all be surprised to see them take their formula outside LA and franchise on what they’ve done. The logistics were perfectly handled. With the exception of occasional wi-fi flakiness (which is to be expected when you have 100+ people on the same network) there really wasn’t one glitch the entire weekend. Strangers stepped up and just did whatever needed to be done whether it was cleaning up or setting up. To me seeing that level of volunteering and frictionless participation is a statement of how healthy their community is. Patrick Vlaskovits is co-author of the eBook at custdev.com and arguably one of the pillars in the whole Lean Startup / Customer Development movement. I had opportunity to have lunch with Patrick on Saturday and got to chat with him more at the event on Sunday. Paleo and Custdev are two of the most life-changing things I’ve learned in the past year and the trip was worth it for these conversations alone. Being introduced to a high-level music contact by Paul as “a custdev warrior” was pretty surreal. Tyler Koblasa is the founder of Mingly (a company ironically whose genesis was as a former Startup Weekend project). They make a Rapportive-like add-on for gmail that gives you CRM capabilities and helps you unify contacts across different buckets and get back in touch with people to cultivate stagnant relationships. We talked in depth about project management, working with remote teams and the food industry and education. It was pretty cool to discover that Tyler had been using our stuff (JumpBox) for the past 2yrs. Emerson Taymor was one of the guys behind Crowdstunt and we got to discussing ideas on how they could adapt their thing to make it more viral. Chris Dumler instructed me on the finer points of Yerba Mate and Matcha teas and convinced me to buy one of these gravity-feed tea strainers for looseleaf tea. Chris also hooked me up with an invite for Namesake, which is something to watch fo. It’s essentially “Quora meets IRC” and when I saw who was in there talking it felt like discovering this secret rave where all the cool kids are hanging out. Nick Seguin of Kauffman Foundation is one of the dudes directly responsible for getting the grants for Venture Hacks and Startup Weekend. Government would never have the foresight to fund these efforts so it’s great to see non-profits like Kauffman step up. Imo Udom is improving the job interview process for companies and applicants with Ovia. It’s basically a way for doing aync, proctored virtual job interviews with nothing more than a webcam and a browser. If you’re trying to cut costs on your hiring processes get in touch w/ Imo – they’re onto something big with this. anyways, there were a ton of people I wanted to mention so just by name only Nicole of Music Boxe, Ryan of CorkHub, Vasily of Mingly, Fernando and Sheryl of the eventify team. You guys all have a place to crash next time you’re in Phoenix. One takeaway I had from the weekend: I would love to see us establish an “underground railroad” for startups amongst the cities. We’ve talked about this in the past and whether it’s something as unstructured as an email list amongst ambassadors who are the hub for each city or something more formal like a tag or prefix to use on airbnb listings, it would be so powerful to set up sister city relationships amongst the incubators and co-work spaces. Anyone from the LA startup scene is absolutely welcome to come out and I’ll personally chauffeur you around AZDisruptors, Co+Hoots and Gangplank and introduce you to the peeps in our tech scene. And lastly, for anyone who happens to be going to the tribal unification / diaspora that is SXSW, I invite you to be my guest at the launch party we’re hosting opening day of the music portion for a new music collaboration startup we’re unveiling. You’ll hear more about it if you follow the SXSW announcements. Contact me and I’ll get you on the list if you’re out there. 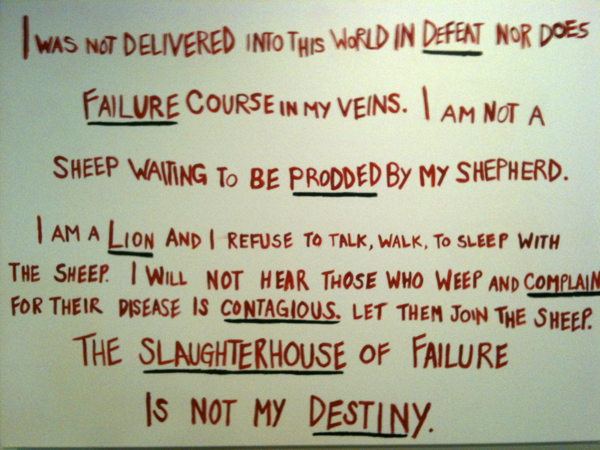 Love that "lion" saying…was that attributed to anyone? I'd love to use it but don't want to steal it. yea it's attributed to Og Mandino, the guy who wrote "Greatest Salesman in the World"